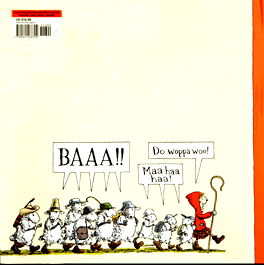 In this uproarious adaptation, Nash and Levine's twist ending ensures a happy ending, and the sheep's speech bubble cacophony provides an entertaining backdrop to a surprisingly tense story. The wry humor of the herd, who crack jokes and banter in speech bubbles alongside the narrative, will appeal to children and lends comic relief to the story of a difficult journey. Sheep act like birds (and people), wolves act like people (and grandmas), and there's even a joke that Betsy's birthday wish is to become a sheep someday, implying a free-to-be-you-and-me vision of identity and parodying the heavily analyzed wolf-dressed-as-grandmother motif of the original tale. Along the way, Levine's sassy flock of wisecracking sheep keep up the comments, their crazy un-sheeplike antics duly recorded in the artwork...Tongue-in-cheek funny, this is sure to find a place alongside Betsy's earlier escapade. Nash stages the shenanigans in an attractive country landscape, supporting Levine's light tone with comical pen drawings of the round-faced, energetic Betsy in the eponymous hoodie and the ten wayward sheep, differentiated by their headgear and other paraphernalia. Good read-aloud fun.